"This quick, frosty blender recipe has a thick texture, beautiful colors, and a fruity, mojito-like taste." Place frozen grapes, applesauce, and lime juice into a blender. Puree until smooth. 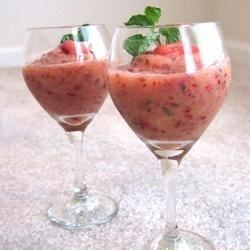 Add frozen strawberries, cubed pineapple, and mint leaves. Pulse a few times until the strawberries and pineapple are in small bits. This was delicious! I just made it for my mom and I, using mint extract instead of fresh mint leaves. Other than that, followed the recipe exactly. Thanks for the recipe! I gave this to my little friends and they thought the mixture was a little applesaucey and didn't like the mint in it. Me and my older friends loved it though.